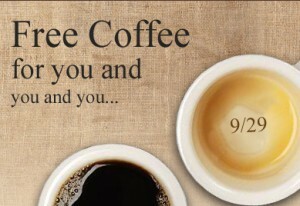 No one really knows how National Coffee Day started, probably a coffee addicts way of getting a freebie! But I don’t care why it’s a free coffee day, I’m just happy National Coffee Day 2013 is coming! Peet’s Coffee & Tea: Order any baked item or a bowl of Simply Oatmeal, and you’ll receive a free small maple latte. Valid from 10 a.m. to 2 p.m. only, using this PEET’s Coffee COUPON. McDonalds – Receive a free small coffee at participation locations. Valid on 9/29 only. Call your local McD’s for details. Kangaroo Express between 8 a.m. and noon on Sept. 29 to enjoy their one-cent, customizable Bean Street Coffee. Caribou Coffee: Score a free small cup of Amy’s Blend coffee at Caribou Coffee on September 29. Today, over 400 billion cups of coffee are consumed each year. It is a world commodity that is second only to oil. Now, I have no idea if this is true but I would believe it!! 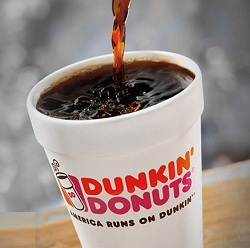 Free coffee on National Coffee Day 2013— celebrate with Dunkin Donuts on September 29 (Sunday). Come on in for a free cup of hot brewed coffee or choose a nice cold iced coffee. All you have to do is present the free offer using the Dunkin’ Mobile App and you will be qualified to receive the free small hot or iced coffee. And on 9/28 & 29, Dunkin’ Donuts will be selling 16-ounce packaged coffee for only $5.99. A limit of two per guest. There are more upcoming offers for free coffee and treats coming — watch for the whole list!